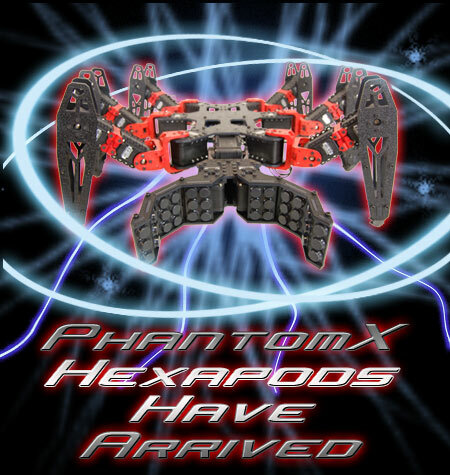 Trossen Robotics is proud to introduce the PhantomX line of pro-hobby & research robotic crawlers. These modular platforms offer an incredible feature list of specs and expandability. With the ability to carry up to 2 kilograms of payload and run at nearly a meter per second these crawlers boast some serious strength and agility. The crawlers come with 6 walking gaits already preloaded and a robust gait engine for further development. Open source software allows for freedom of development and community collaboration. Control wirelessly from the Arduino compatible RC Commander, wirelessly to a base PC, or from an onboard miniPC. Accessory add-ons coming soon include a Claw, RoboTurret, and Telepresence IP Camera. Sturdy, yet flexible ABS material make the Hexapods tough and hackable for individual projects. Drill, cut, screw, and bolt to modify and hack your bot. These crawlers raise the bar on hobby and entry level research robotics while lowering the cost point for so much technology. Demand has been high for these kits so production runs have been going fast. We recommend getting your order in queue to reserve your kit. We appreciate everyone’s patience as we ramp up production! This entry was posted on Wednesday, January 12th, 2011 at 3:56 pm	and is filed under Front Page News, New Kits / Products. You can follow any responses to this entry through the RSS 2.0 feed. You can leave a response, or trackback from your own site.